Caitlin Cimino is a senior at Lakewood High School. She has done gymnastics, indoor track, and track and field for all her four years of high school. 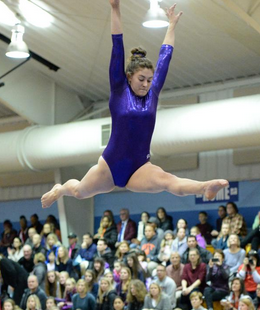 She was a captain and the only senior for the gymnastics team this year. She also did gymnastics and indoor track during the same winter season which is a huge commitment. For the track team her event is pole vault which is greatly enjoys. She is also in National Honors Society, French Honors Society, and is a co-president of the Lakewood High School Key Club. I was able to ask Caitlin some questions. Q: What was your favorite gymnastics and track memories? Q: What are you most excited about for the rest of the track season? Q: How long have you been doing gymnastics for?